Throughout history, warriors have always needed food, maps, flint, sharpening stones and the like. But where to put them? Chainmail with pockets wasn't really in vogue in the Middle Ages, and knights with purses didn't really catch on like some merchants had hoped. Fortunately, the belt-pouch was invented and warriors everywere could carry their small items with efficiency and pride. 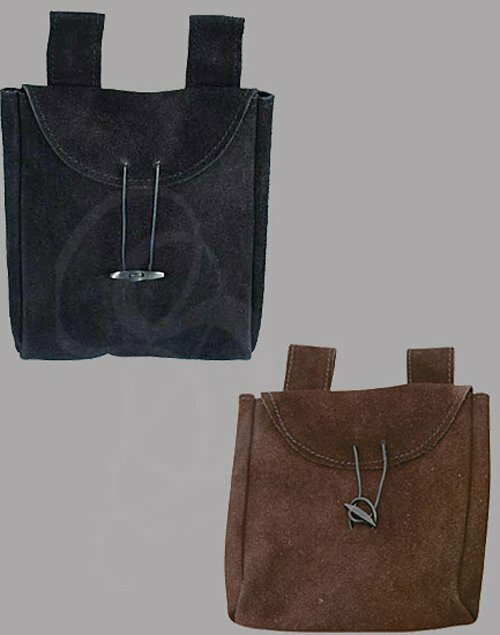 The pouch is made from suede and is just large enough to fit small items of food, cell phones, keys, wallets or severed fingers. 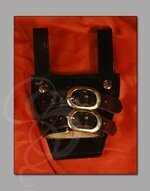 It features an intricately carved fastener made of bone and leather thongs for tying it shut. A double-stitched belt loop is attached to the backing making for easy donning and doffing (is doffing a word? Am I interrupting the flow of this sentence with this outburst? None of these questions will be answered here, gentle reader. Apologies for the interruption). 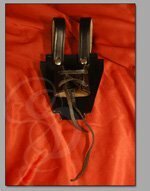 This is a stunning, rugged and historically accurate addition to any belt or costume. Enjoy. Materials: Suede Leather Body. Carved Bone Fastener.